Stud welding is, in simple terms, the process of welding a stud to another piece of metal. To elaborate, it is a single side fastening where the bottom of a metal stud is melted and fused to a metal sheet - in welding terms, this is referred to as the ‘parent material’. Stud welding is popular with engineers and manufacturers largely due to how versatile, fast and cost-effective the method can be, with the right equipment. There are a number of different stud welding methods, which involve slightly different techniques and pieces of equipment to carry out. Generally though, stud welding is done by producing a strong arc of electricity, using some kind of power source, which causes the metals to reach melting point. As the metals are melted, force or pressure is used to press the stud and the metal sheet together to form a secure and reliable fusion. Stud welding is preferred to other welding methods as it doesn’t require a hole to be made in the metal sheet so the material is not weakened and there is no room for leakage, hence no corrosion. Taylor Studwelding are the UK’s leading designer, manufacturer and supplier of stud welding equipment and tools to enable any process to be conducted efficiently and effectively. Their wide range of stud weld products means that they can meet the needs of any client, whether you are seeking a maneuverable and simple stud welding machine or you need a fully automated system that can carry out multiple stud welds per minute. What are the benefits of stud welding? There are a range of benefits of using stud welding which make this technique suitable for use in numerous industries and for different purposes. One of the big advantages of using this method in your metalwork is that the weld is (or should be) practically invisible from one side. This is, of course, due to the fact that a stud weld is a single side fastening. There are certain stud welding processes that allow for a cleaner weld and cause minimal marking on the reverse side of the metal sheet, such as capacitor discharge. This feature of stud welding makes it popular for use for professional name-plates, counters/furniture and basically any function where the appearance of the joint is a priority. 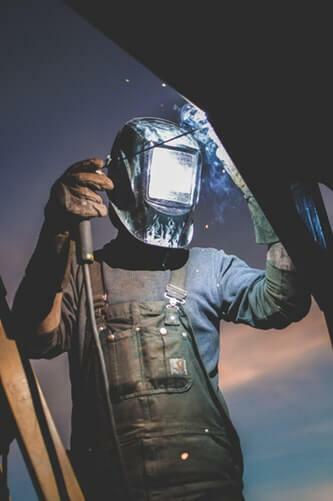 Don’t worry though, although stud welding is recommended for it’s ‘invisible’ appearance, it is still equally if not more secure than other welds formed using other methods. What’s more, stud welding allows for greater flexibility with regards to the materials, diameters, and equipment used. Particularly the drawn arc and short cycle methods, which can be used even with materials that are coated, rusted, uneven or slightly thicker. The fact that there are a number of different processes to use when stud welding is what makes the method so adaptable. Whether you are working with stainless steel, mild steel, aluminium, copper, brass etc. - if you ensure that you use the suitable method and studs, practically any metal type can be stud welded effectively. As well as being highly flexible, stud welding is a highly accessible method to incorporate into your manufacturing. Firstly, because you only need access to one side of the metal sheet/parent material to stud weld effectively. On top of this, if you are working in hard-to-reach or awkward places, you can opt for lightweight and easy to manoeuvre equipment. Stud welding can also be carried out impressively quickly so, for example, if speed is what you are after, this is likely the right technique to go for. This does, of course, depend on the equipment and tools that you buy or hire - opting for the more heavy-duty equipment will give you much quicker results. Another major benefit of using stud welding in your metalwork is the quality and security that comes along with it. The process doesn’t require any holes to be made in the metal sheet, which eliminates the chance of any leaking or corrosion completely. Stud welding is, therefore, an extremely long-lasting type of weld and can be relied on for a range of important functions where safety is key essential, such as in bridges and buildings. Taylor Studwelding Systems Limited have gained their reputation from being experts in the stud welding industry for over 35 years. They are currently the UK’s leading designer, manufacturer and supplier of a wide range of stud welding machines, systems and weld studs. Their product range allows the specific needs of all types of clients to be met with exceptional standards - no matter how complex the requirement.